Relax and enjoy a breath of fresh air - The Lasko Wind Curve is ready to provide a cooling breeze and freshen any room in your home with its sophisticated, space-saving design. 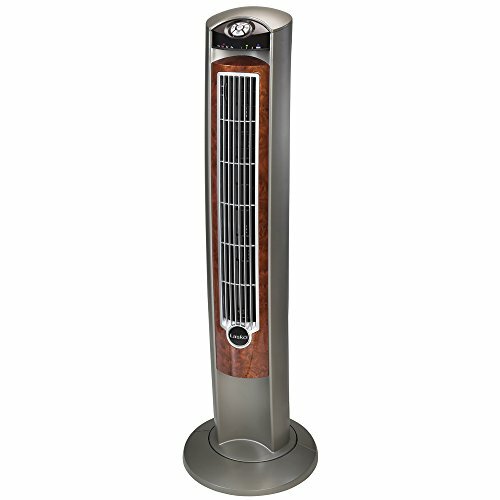 At 42.5"" in height, this oscillating tower fan provides quiet, high reaching and widespread air circulation. Fresh Air Ionizer option helps combat air pollution in your home by emitting millions of negative ions that trap fine air contaminants such as pollen, mold, and dust. This feature is ideal for those with allergies, asthma, or breathing sensitivities and creates a fresh, outdoor feel. Multi-function remote allows you to power the fan on or off and adjust fan speed, auto-timer, fresh air ionizer, and oscillation settings from anywhere in the room. Lasko Metal Products was founded in 1906 by Henry Lasko in Philadelphia. As America moved to the suburbs in the mid-20th century, Lasko expanded into small appliances, fans, and household portable heaters. From there, the company added manufacturing locations in Tennessee and Texas. Today, Lasko is an international organization and a market leader in home comfort products. A lot has changed in the past 100 years, but one thing remains the same: our deep-rooted commitment to quality and value. We take pride in providing our consumers with great-looking, high-performance products. It's built for comfort and it's built to last, it's a Lasko. If you have any questions about this product by Lasko, contact us by completing and submitting the form below. If you are looking for a specif part number, please include it with your message.